One of the most significant books of recent years — and one that should be a must in every pastor's library — is Margin by Dr. Richard A. Swenson (NavPress). Although Swenson writes to the general public, his message could not be more applicable to any of his readers than it is to those in pastoral ministry. 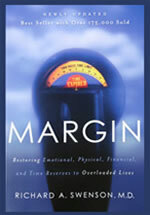 As defined by the author, "margin is the amount allowed beyond that which is needed. It is something held in reserve for contingencies or unanticipated situations. Margin is the gap between rest and exhaustion, the space between breathing freely and suffocating. It is the leeway we once had between ourselves and our limits." (pp. 91-92) In the same way that a lack of margin on a printed page is aesthetically displeasing, hard to comprehend and even somewhat chaotic, our lives will become overwhelming and endangered when they do not contain sufficient margin. Our lives will become overwhelming and endangered when they do not contain sufficient margin. Christians in general, and pastors in particular, often respond to such cautions by misusing Scripture. "I can do all things through Christ who strengthens me," said Paul. And if Paul could do it, can't we? Swenson says no, reminding us that it is God the Creator who made limits a reality, and it is the same God who placed them within us for our protection. We exceed them at our peril! Margin is not a spiritual necessity. But availability is. was published by NavPress in 1992. When I was a young child, I heard someone say that everyone should have a safe place, a secret location where they could go to get away, relax and reflect. It seemed like wise advice, so I set out to find one for myself. My story may not surprise you. It may even sound familiar. I could spend six or seven hours effectively listening in our counseling ministry, then arrive at home distant, distracted and deaf.